Is God making Israel's military as powerful today as it once was in the Old Testament? Lamb & Lion Ministries conducts a number of Bible conferences in the Dallas, Texas area each year. 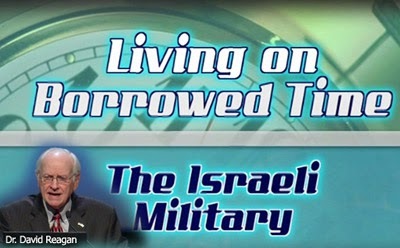 Our June 2013 conference theme was Living on Borrowed Time (watch). We also hold a special banquet afterwards, and there is where I gave this all new presentation on the prophetic significance of the resurgence of Israeli military power since the establishment of the state of Israel in 1948. I want to take a look in-depth at just one of the seven prophecies related to Israel in the end times, and the one you would least likely expect me take a look at. I want to take a look at this prophecy being fulfilled today, and that's the resurgence of the Israeli military. When I say resurgence, I have in mind the fact that the Jewish people were a formidable military force in Bible times as long as they were operating in the center of God's will. Just think about it for a moment. They established a reputation for military power the very moment that they entered the Promised Land when they overthrew the city of Jerusalem. That sent terror throughout the land. The Canaanites began to fear them. They continued to conquer the whole land in victory after victory, including the Jebusite city of Jerusalem which they made as their capital. Many of Israel's military victories were very miraculous. For example, there was this historical victory that occurred in the Valley of Jezreel, or as we call it, the Valley of Armageddon. The mountain backdrop is Mount Tabor, seen up on the high elevation right out of Nazareth into the Valley of Jezreel. Deborah and Baruch defeated the Canaanites in the Valley of Jezreel at the base of Mount Tabor. That's one of the most miraculous victories in all of Old Testament history. Or, consider this one. Gideon with only 300 men was able to defeat the combined armies of the Midianites and the Amalekites by attacking them in the middle of the night and scaring them half to death. How about this scenario? David and Solomon united the kingdom and they built up a great military power. But, then the day came when the kingdom was divided. The Northern Kingdom was always in rebellion against God, but the Southern Kingdom was in His will. Because of God's will He greatly blessed the Southern Kingdom, including miraculous victories one after another throughout the history of the Southern Kingdom. The most miraculous victory to me occurred during the time of King Jehoshaphat, who was a very righteous king. He defeated the combined armies of the Moabites and the Ammonites by sending forth an army of praise worshippers. Can you imagine that? The enemy are already for battle and they look up and see that here comes the army of the Israelites, and it's all praise worshippers! They're dancing, they're praising, they're singing, they're playing musical instruments. The Scriptures say that strategy threw the enemy into such disarray that they became so befuddled that they were in total confusion. The Israelites then ambushed their enemies and completely routed them. There were so many amazing victories that Israel had back in the Old Testament days. In the third segment of our study on the end times sign of the the resurgence of the Israeli military, we'll look at their War of Independence in the Twentieth Century. I have always believed that when Israel, led by the Spirit-empowered Moses, overcame the absolute political power exercised by the Pharaoh of Egypt to win their freedom, and then escaped his overwhelming military might, which was subsequently utterly destroyed in the sea in the Strait of Tiran (mouth of the Gulf of Aqaba), that these fact preceded the arrival of the Israelite arrival in the Promised land by 40 years. During those 40 years word of mouth heralded the approaching Israelites and their fighting men. At Jericho it was Joshua and Caleb and all those young fighting men who were born during the 40 years of wandering which entered the land to take possession of it by military conquest. These were troops who honed their warfighting skills while constantly OTM (On the Move). They had no bases, no military camps as we know them today. They were an exceptionally effective force which engaged every enemy in maneuver warfare led by the LORD God and the Ark of the Covenant. This was the most invincible military force ever to take to the field of battle on planet earth... bar none. In Judges 7:1-25 the only 300 men are used because The Lord had Gideon lessen the number because The Lord didn't want them to say their own hand saved themselves. In Judges 7:7 ...The Lord says that "I have delivered it unto thine hand." So it seems in the history of the Jewish people that The Lord is who delivers them at amazing odds against amazing evil and not themselves. The future for Israel is not in their military might but rather in the Might of The Lord.